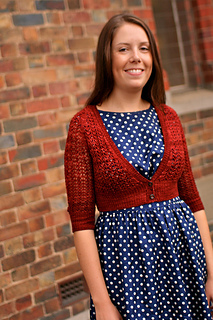 Cecilia is a sweet lace cardigan that is perfect to throw on over your favourite summer dress. 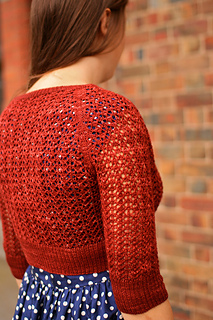 Knit in one piece from the top down, it works up surprisingly quickly from a few skeins of your favourite sock yarn. 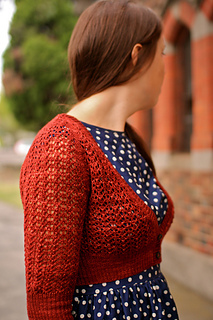 This pattern is suitable for intermediate and advanced knitters. It combines an all-over lace pattern with raglan shaping, and beginners may find increasing in lace pattern challenging. 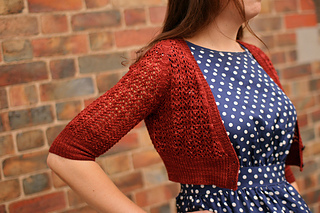 Block your swatch by washing it and pinning it out to open up the lace pattern. Once dry, unpin your swatch and measure gauge.